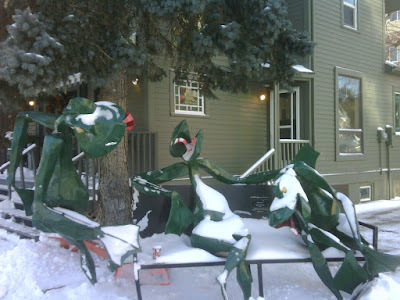 This is a picture of three metallic frogs sitting on a snow covered bench in Calgary. It was taken before Christmas when it was much colder, not like the spring like Chinook conditions we're having today. It is an urban art sculpture done by Peter Smith titled "Hanging Out." Believe me when I say that anything 'hanging out' that day would have been frozen! I love the coffee cup beside the one frog. My friend Amber took this pic when she convinced me to have lunch and go shopping with her and her husband when it was -30 below. Shopping - not in a mall - but from shop to shop walking out on the street. "It's great, no crowds," observed Amber. "That's because normal people are inside with a cup of chai and a good book!" 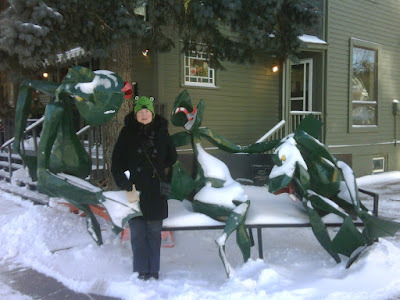 That's a small bag of Rocky Mountain chai tea, that I'm holding, that she had given me for my birthday, and I'm wearing the requisite frog touque. Here's to warmer weather and not wearing a frog touque! What a great sculpture! Glad you didn't freeze to death.